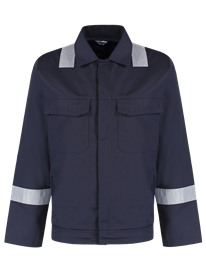 Alsico’s range of workwear jackets includes work jackets in different weights, colours and sizes. Our zip jacket comes in 245gsm polyester/cotton and can be laundered in an industrial wash. It has a concealed zip fastening and the two breast pockets have flaps that have stud fastenings. It also features two lower pockets, shirt vented cuffs and an action back. There is also an option available with side waist elastication, twin needle stitching and plain hemmed sleeves. There is also a version available with reflective tape on the sleeves and shoulders. These popular jackets are available in royal blue or navy. Alsico’s stud work jackets have a similar specification to the zip workwear jackets, but are available in a wide range of colours including black, bottle green, blade blue, smokeberry and convoy, as well as the usual blues. Available in men’s sizes from 92cm to 140cm, they are easy to care for. The Alsi stud jacket with reflective tape is available in navy and royal blue. 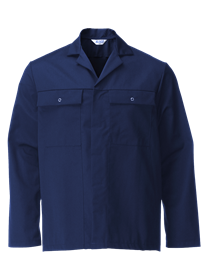 We also supply Gryzko work jackets, again in 245gsm polyester/cotton. 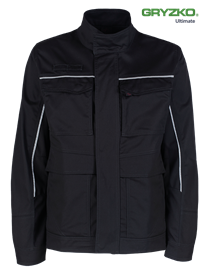 The Bi-Colour Jacket features contrast shoulder panels, inner collar and inner lower pockets. 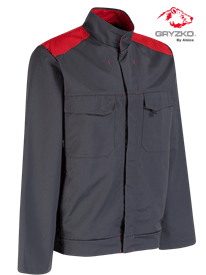 This work jacket has a concealed stud fastening, breast pockets with stud fastening flaps, and two lower pockets. There are front and back yokes and side waist elastication. They also feature contrast twin stitching and bar tacks. Colours available include black/charcoal, black/Seville orange, charcoal/empire red, navy/empire red and black/racing green. The Gryzko jacket has a contrast front and back yoke and features reflective tape to aid visibility. Another important feature is the internal smartphone pocket and there are also two internal poacher’s pockets, in addition to the breast pockets and the lower pockets which have concealed zip fastenings. The zip front fastening benefits from a storm flap and the long sleeves have a two stud adjuster. 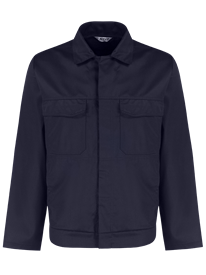 Available in five colourways, this is a practical and smart workwear jacket.